We've seen manufacturers making hatchbacks and then sub-4m sedans around them. However of late, the trend seems to have changed. It started with Tata Motors first offering the Zest sedan and then the Bolt hatchback. 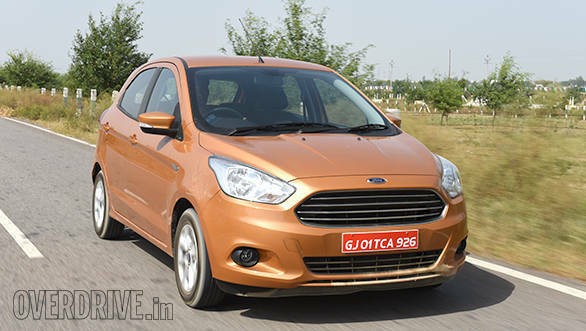 Now Ford has followed it up with the Figo Aspire and now the Figo hatch. While we were pretty impressed with the sedan and it even won our compact sedan comparo, will the hatchback be equally impressive given that it is identical save for a couple of litres of boot volume less? We find out. Remember the Hyundai Grand i10 and the Xcent? While both look nearly the same from the front, the differences are apparent once you move to the side. However, in the case of the Figo hatchback, it loses a little of the aggressive character of the Aspire sedan. It is still a handsome car but then the Aston Martin-like grille looks better on the Aspire. There are those big angular headlamps which look just right on this car. In fact, from the front three quarters, the car bears a resemblance to the Fiat Punto. The diesel variants run 14-inch Apollo Amazer 3G Maxx tyres and the alloys available from the Trend trim and above look good. The petrol AT variant runs MRF ZVTS tyres. The rear end is typical of European cars, stubby and with wraparound lamps. 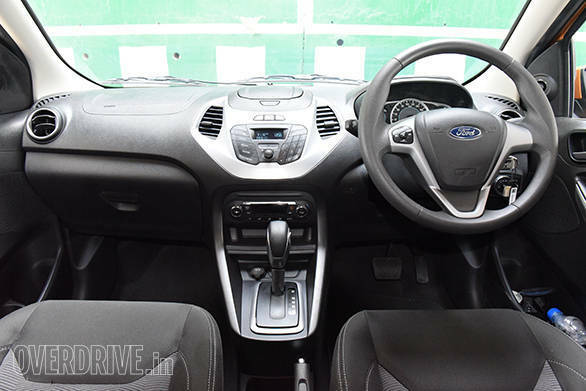 If you have been in the Ford Figo Aspire, then you will immediately feel at home in the Figo. However while the Aspire gets a beige option, the Figo makes do with all-black upholstery. The small steering wheel with audio and telephony controls mounted on it feels delightful to hold. The instrument console is dominated largely by the speedo and is flanked on the left by a tacho and on the right by a fuel gauge. This is the second Ford after the Aspire to have its lighting system controls on the right stalk and wiper controls on the left. This was primarily because it has been designed for right-hand drive countries. 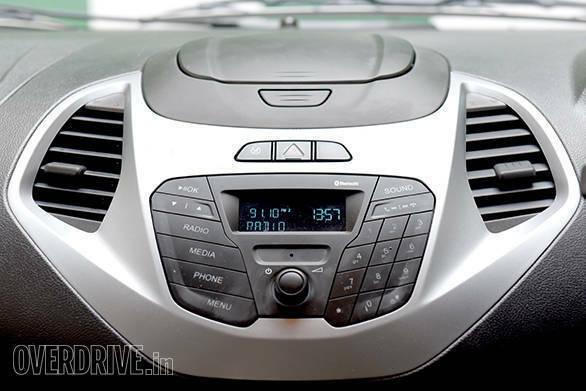 Ford has added Sync and other features from the Aspire. While that's great for the technology junkies, it really boils down to if you really will use these features in real life. For example, I have used the Grand i10 and Xcent on multiple occasions, however, I have never used the 1GB onboard music storage. Similarly, I might never use the Sync or emergency assistance (useful) features. Amongst the most practical features, there are power adjustable mirrors, auto locking doors when in motion, various cubby holes in the cabin and the electric boot release and keyless entry. In terms of space, the new Figo hatch loses out a little. 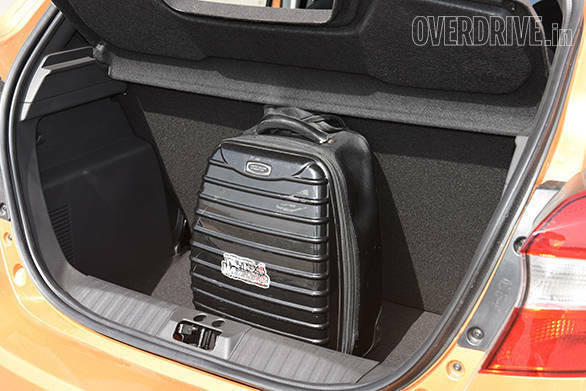 The trunk space has been reduced from the outgoing model's by 30 litres. But the rear seats will feel a little cramped for three grown ups. The music system is quite decent and better than the competition. The air conditioning as advertised by Ford is very powerful and cools the cabin well. Features that are missing include reverse parking sensors, reverse camera, an unlock sensor for the boot. Yes, Hyundai has indeed spoilt us! But there is a strange inconsistency in the way Ford have spread the features across the variants. For example, the diesel Titanium+ variant misses out on the MyFord dock feature, but the petrol with automatic gets it. Again, the interior of the petrol automatic is very different - it doesn't get the Sync feature, the infotainment screen is smaller and there are only two airbags (as opposed to the six airbags that are otherwise standard on the Titanium+ trim). But what it gets is traction control, hill hold assist, ESP and gear indicator. 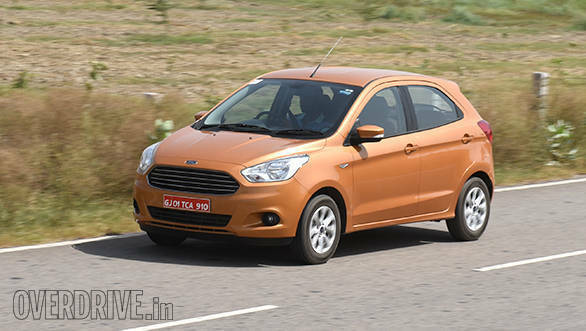 Having a similar crop of engines for the Figo hatch and Aspire allows Ford to cut down on manufacturing costs. The petrol and diesel engines are even offered in the same state of tune as the sedan. 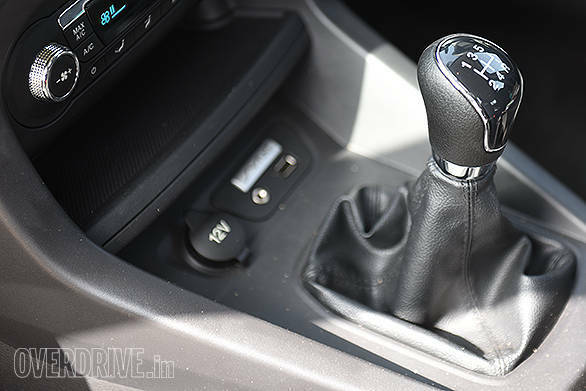 There is an 88PS/112Nm Ti-VCT petrol that's mated to a 5-speed manual and is claimed to have a fuel efficiency of 18.16kmpl. Unfortunately, Ford didn't have a car ready for us at the time of the review. The second petrol engine will be available only in the Titanium trim which lends it an exclusivity and therefore, lesser sales. It is a 1.5-litre naturally aspirated motor that puts out a class leading 112PS/136Nm and a fuel efficiency of 17kmpl. The novelty is the PowerShift dual clutch transmission. In D mode, it is a bit sluggish but the car comes into its element in the Sport mode where the shifts are quick and the revs are held right until the redline before it shifts to a higher gear. Similar to how the dual clutch equipped Volkswagen Polo TSI moves. However, the variant which should be much sought after for its driveability and fuel efficiency will be the updated 1.5-litre diesel motor. In its 100PS/215Nm tune, this motor is a gem as far as driveability is concerned. It is not so quick revving though and is mated to a 5-speed gearbox. It is quiet at low speeds, however, when given the beans, it does make some noise. Hot hatch? Not so much to me. 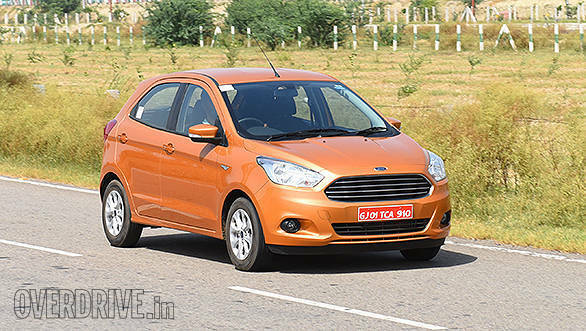 The 1.5-litre petrol engine has potential to be one - I think Ford should consider offering it with a manual transmission. I can imagine that making the car sprightlier and more fun to drive, right from the word go. An all-new B562 platform forms the underpinnings of the Figo and Figo Aspire. 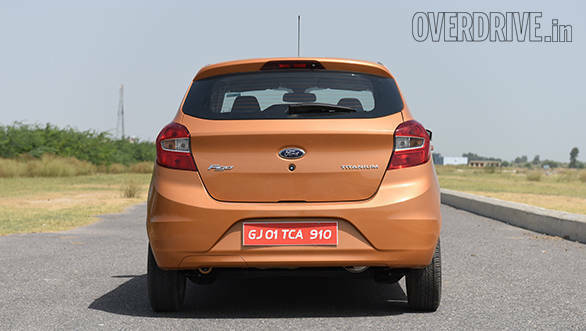 Ford have increased the ground clearance of this car from the outgoing version to now 174mm. The car rides well over bigger bumps, however, the smaller ones do unsettle the vehicle a bit. The handling is typical Ford. Precise. The steering is light but weighs up decently at high speeds. The car holds its line well during hard cornering while the brakes themselves are sharp and shed speed rapidly without much fade. Stability on the Yamuna expressway where I drove the car was also impressive. The Figo Aspire and the hatchback don't have much to tell them apart, except for the boot. There is a difference of almost Rs 60,000 between the Aspire and Figo, when you compare the base trims - the price difference increases as you go up the variants. The new Ford Figo hatchback is a well rounded package and I believe it's going to find takers among the younger car buyers in the age group of 22-28 and for even mature buyers between 40-50. 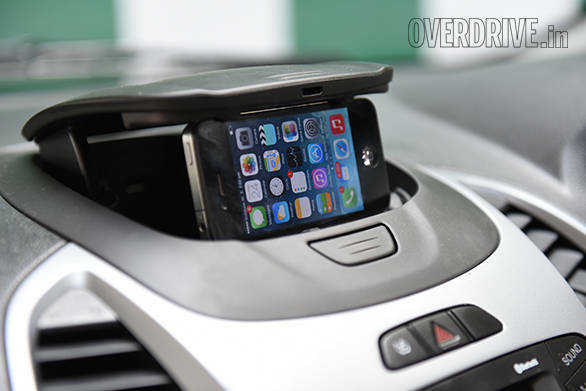 It has Sync and a good music system to keep them entertained while the Ford MyKey and other features will appeal to those who have youngsters who are learning to drive. The MyKey will be a good start for youngsters who're only just developing a driving sense - there are several restrictions which can be imposed on them including the use of seat belts as the music system would not work without it.